Our Labor of Love is a group of amazing photographers. They did our wedding six years back, and we LOVE their work. That's why we're so excited that we can continue having them capture our memories with their annual Lovebugs shoot via Seed Factory. The gist of the Lovebugs shoot is that kids are invited to bring their favorite lovies and the shoot itself is really them running around just being kids in a big open warehouse space. The pictures are gorgeous, and I love how they capture Gemma's energy and silliness in a way that a more staged photoshoot just can't. Just couldn't resist sharing! There seem to be infinite pretty options for girls rooms, but boys' rooms can be tough. 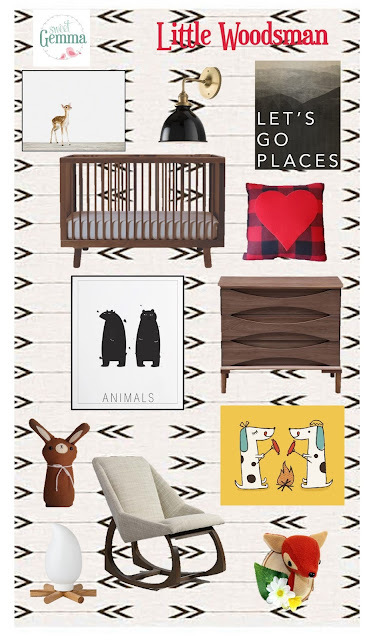 Fortunately, we've found plenty of stylish, playful art just perfect for your little buddy. Whether your tastes skew quirky, mid-century modern or sophisticated, this round up of our fave art for boys has something for you! 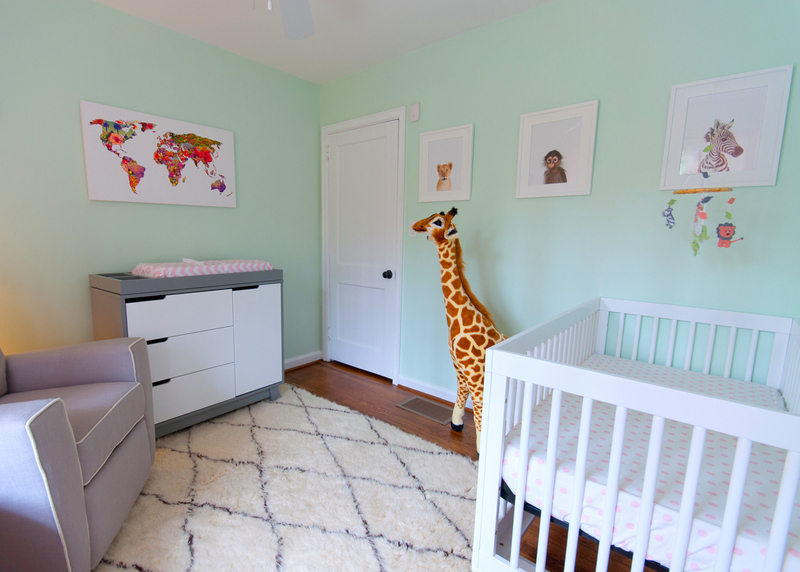 It's #ThrowbackThursday, so I thought I'd share Gemma's nursery transformation from last summer. When we moved into our house last summer, everything from the paints to the hardware to the wood finishes was dark, dark dark. It just wasn't our style at all! The room that was to become Gemma's new nursery was UGA and Braves themed with dark gray and red paint and awkward walls/ceilings that made decorating a challenge. With the help of Laura from Matchstick Interiors we transformed this room into something sweet, modern and infinitely lighter! We dealt with the many odd shaped walls/ceilings by doing most of the room in white with 2 pink accents and 2 gold stenciled accents since there was limited wall space for art. Don't you just love the gold floral pattern? I've always been in love with Oh Joy's Hygge & West Petal Pusher Wallpaper but didn't want to commit to wallpaper. So we used this lush Garden Rose stencil and Modern Masters Pale Gold paint. A word of warning, we used a professional decorative painter to do this wall, and she found this stencil to be challenging to work with and it took her 2 full days to get 2 accent walls done, so it's not a project for the faint of heart! But the effect is gorgeous and in my mind, totally worth it! Want to inject some pink glam into your girl's nursery? Check out Modern Ombre Watercolor Horse, Modern Rocker Flowers, Oh La La or Spring 1! Want help creating a unique nursery for your little one? Laura at Matchstick Interiors can help! You can reach Laura at matchstickinteriors@icloud.com or 770-366-4337, and follow her on Instagram@msmatchstick. I was inspired by this awesome Cavern Home Tapestry Wallpaper. Doesn't this room just conjure images of future nights by a campfire? I choose art with a playful outdoorsy, woodland vibe. We've been snowed in twice in the last couple weeks here in Atlanta. This nursery takes inspiration from my craving for some Florida sunshine and ModernPop's ultra cool mid-century inspired Flamingo print. 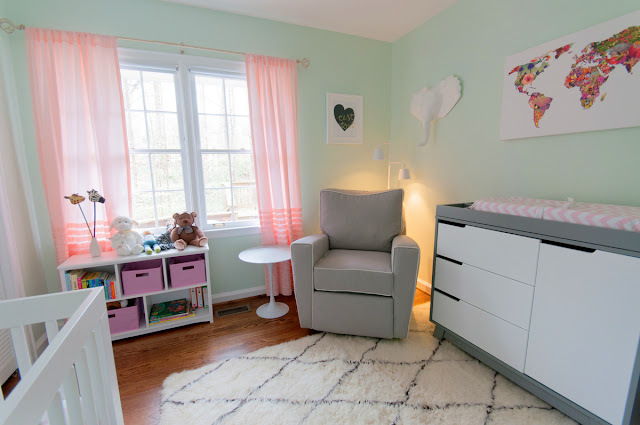 It's feminine without being twee, and pops of gold and cool mid-century lines make this a room mom and baby will love. 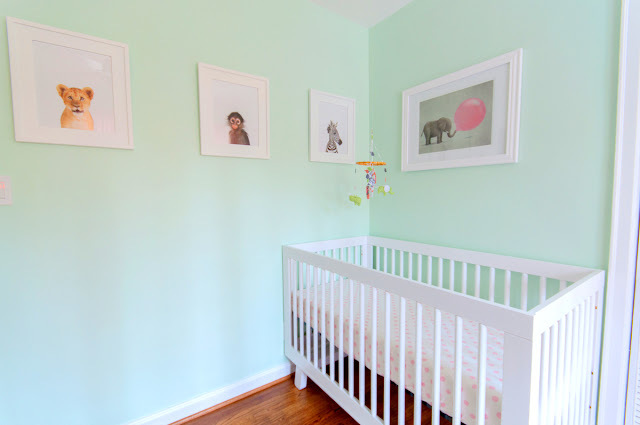 When it was time to design a nursery for our sweet Gemma, I was a woman obsessed. I went wayyyyy down the rabbit hole of reading design blogs, pinned a zillion things to my nursery pinterest board and created a ton of inspiration boards with different color palettes and themes. We knew we wanted something modern and sweet with a gender neutral color palette we could reuse if we have a boy in the future. In the end, we chose a soothing palette of mint green (Lighter Mint by Sherwin Williams), gray, white with pink and gold accessories we can change out later. I am OBSESSED with the adorable baby animal prints from Animal Print Shop, so they were our starting point for the room. We didn't want the room to be overly themed, so we used African animals with a light hand. In addition to the baby animal prints, the other major animal related purchase was the giant stuffed giraffe. I've since seen this giraffe crop up in tons of online posts about cute nurseries, and it even made a cameo in Jonah Hill's bedroom in 21 Jump Street and was a plot point on The Big C! We went around in circles about getting a glider. Most of what is out there is horrendously ugly and expensive, and I couldn't bear to buy something I'd hate to look at. The Little Castle Monaco Recliner turned out to be a perfect match for our needs. It has clean lines and has been comfortable enough for hours of reading, cuddling and feeding. Cribs tend to be a bit old fashioned and frou frou for my taste, especially at local Atlanta retailers. I loved the mid-century modern vibe of the Oeuf Sparrow crib but not the ginormous price tag. Fortunately, the Babyletto Hudson crib looks just like it, and although the wood isn't quite as high end, 8 months later the wood still looks great. We had our eye on fancier dressers but just didn't have the room, so we chose the gray and white version of the Babyletto Hudson changer. Although the measurements supplied on line don't appear to match up, the LA Baby Changing Pad fits perfectly on top of it.